Cupcakes are something you may not think of when you think about Seattle… but hidden in some of the hippest neighborhoods are a few cupcake shops that are sure to surprise. 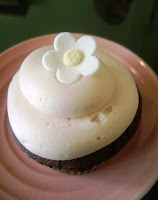 My husband, daughter and I went on a Mini Cupcake Crawl of the Seattle/Tacoma area this weekend. I had four cupcake shops to visit, but only got to three before they all closed. Each had delicious cupcakes, but served them in different style of environments making each stop a unique cupcake experience. First stop was Hello, Cupcake in Tacoma, WA. 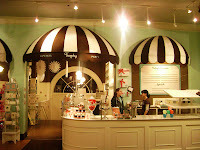 This cupcake shop is located on the University of Washington – Tacoma’s campus set between several stores, coffee shop and is housed in an original old Tacoma building. You’ll notice the old tall, brick buildings that line the street in the photo. 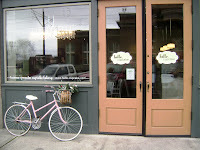 The store front was quaint and inviting and even had a pink bike with a basket leaning against the front window, making it feel like a place you could just ride your bike up to, stop in for a cupcake and relax. The vibe inside was very pretty pretty princess. It was clean with lots of light colors. They also had a party room in the back where a little girl was having her birthday party. 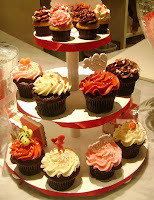 I had been in this cupcake shop before, so I already knew which cupcakes I wanted to eat. My daughter picked her favorite, chocolate cupcake with vanilla buttercream frosting and my husband chose the carrot cake with cream cheese frosting. The chocolate cupcake was very moist, I love a moist cupcake. And the buttercream frosting was smooth and delicious. 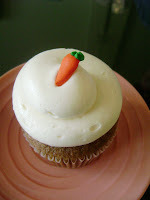 My favorite though was the carrot cake cupcake. The cinnamon in the cupcake was so flavorful and the cream cheese frosting was a perfect pairing. Our next stop was Cupcake Royale in Ballard, WA. This location is 1/2 cupcakes 1/2 coffee. 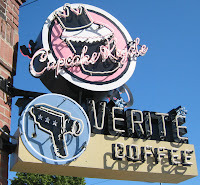 Verite Coffee and Cupcake Royale share a space in the Ballard neighborhood of Seattle, WA making it a very “urban” cupcake shop. Hip, young music paired with eccentric art on the walls and a carefree staff make Cupcake Royale (CR) a true taste of the Seattle life. There was great diversity in visitors at Cupcake Royale. There were college students with their laptops studying while eating a cupcake and enjoying their cappuccinos, 40-something girlfriends catching up on old times, a few people sitting alone, enjoying their treats behind their computer screen, and of course, my family. There was a much larger selection of cupcakes at Cupcake Royale, including some specialty cupcakes that I wasn’t expecting to see. 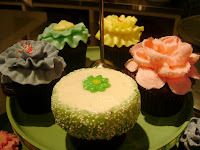 Orange U Glad, Lemon Drop, Lavender, Peppermint Pattie to name a few… all served on either vanilla or chocolate cupcakes. We chose to sample the Lemon Drop and the Peppermint Pattie as well as a mini Chocolate with pink buttercream frosting for my daughter. 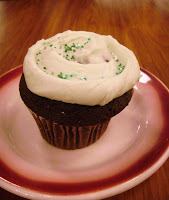 The Peppermint Pattie cupcake had a moist, chocolate cupcake with a peppermint buttercream frosting. My husband LOVES peppermint and this cupcake was right up his alley. The buttercream peppermint flavor had just the right amount of mint flavoring… not too over the top, just enough to make it taste minty delicious in your mouth. The mini cupcake was perfect size for my daughter. 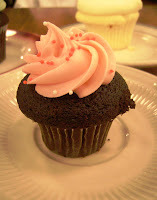 It was your basic chocolate with buttercream frosting cupcake, but the frosting was pink with sprinkles. 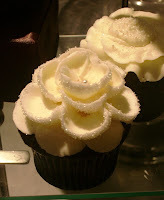 This cupcake definitely made my little princess feel like she was eating a dainty, cupcake made just for her! “Emily-Size” we called it! 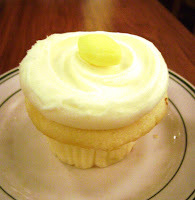 This Lemon Drop cupcake was a surprise in my mouth. Lemon buttercream frosting on top of a vanilla buttercake cupcake… MMmmmmmmmmm Yummmm-O is really all I can say. It was an explosion of flavor in my mouth. Sweet, sour all at the same time. Smooth. This was one of my favorites of the day! Our last stop was to Trophy Cupcakes and Party in Wallingford, a suburb of Seattle, WA. This neighborhood is a little more upscale from Ballard and the cupcake shop was located inside the Wallingford Center full of shops and restaurants. Trophy had the largest selection of specialty cupcakes on display in comparison to the other two shops, although none of them were for sale. Bright colors, unique frosting, flowers, sprinkles, Valentine’s Day themed, all white. Very beautiful displays. They were really fun to see! Since we made it to Trophy only an hour before closing, all they had left was the triple chocolate cupcake. We cut into the moist cupcake and took a bite. 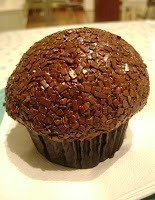 This was the richest, most chocolatey cupckae we had tasted all day. It was too much for any of us to finish. We left 1/3 of the cupcake on the plate. 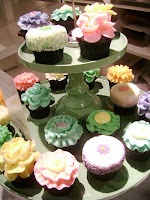 We also tried a very special cupcake, which I have to say was probably my most favorite cupcake of the day, astecially. 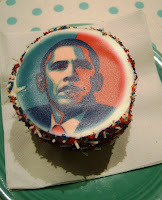 It’s the Barack Obama cupcake. Chocolate cupcake with vanilla buttercream frosting with sprinkles on the side with Baracks face on the top of the cupcake. His face made with edible ink and a special printer that prints on to the cupcake. Although the buttercream at Trophy had a thinner texture and tasted less like butter than others it was just as delicious. 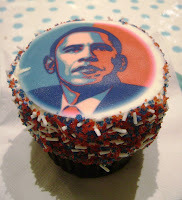 These novelty cupcakes would be a great addition to a Jan. 20, 2009 Presidential Inaguration Party! I may just order some!